Scratch Shield is a clearcoat that is more scratch resistant compared with conventional clearcoats, helping a vehicle maintain its new look for a longer period of time. 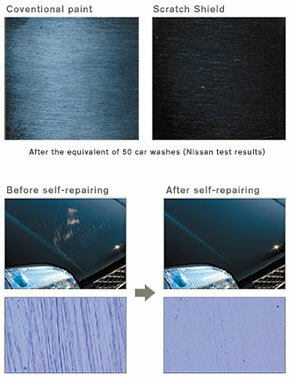 The paint also repairs fine scratches, restoring a vehicle's surface close to its original state. Nissan will continue to expand the adoption of Scratch Shield globally. After being scratched, a car surface painted with Scratch Shield will have five times less the number of scratches compared with a vehicle painted with a conventional clearcoat. Scratch Shield repairs fine scratches, restoring painted surfaces close to their original state anywhere from one day to one week. A special highly elastic resin has been combined with a conventional clearcoat to increase the paint's flexibility. This has also increased its strength by raising the resin density.